Get ready for more Meadow Dance inspiration! We've seen what Amanda Murphy has created with her new fabrics (click here if you missed it), and now it's time for some more fun! 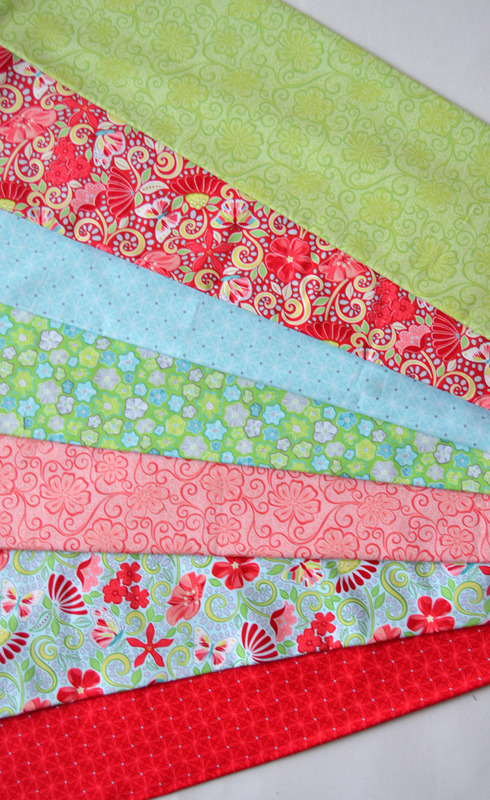 This week we'll be featuring four different projects using the gorgeous Meadow Dance florals and coordinates. 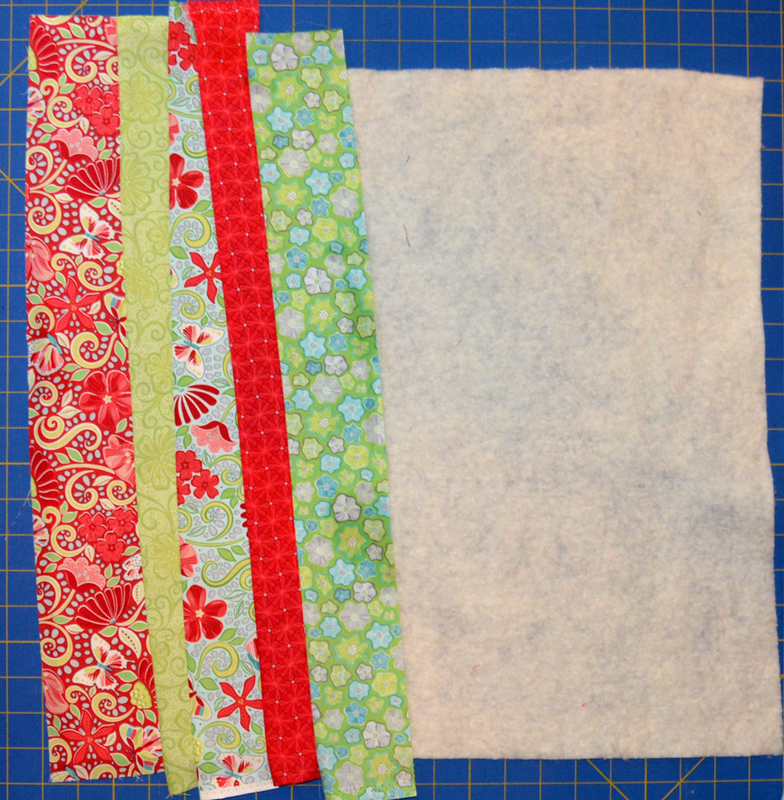 Enjoy the tutorials, and make sure to enter to win a fat quarter bundle! 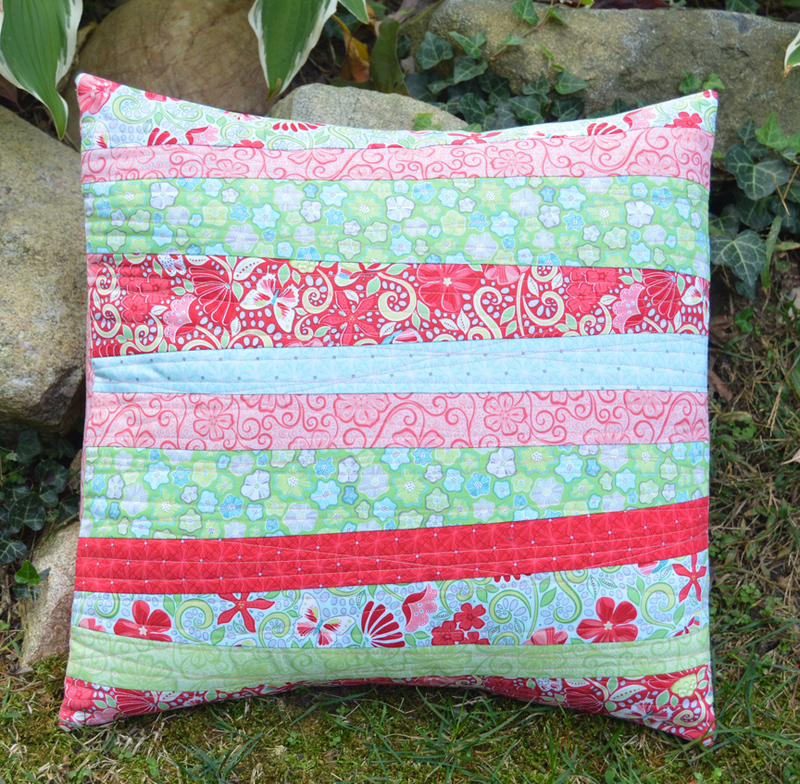 Today we're sharing two strip pillows using the red floral and coordinating red, teal and green prints from the Meadow Dance collection. 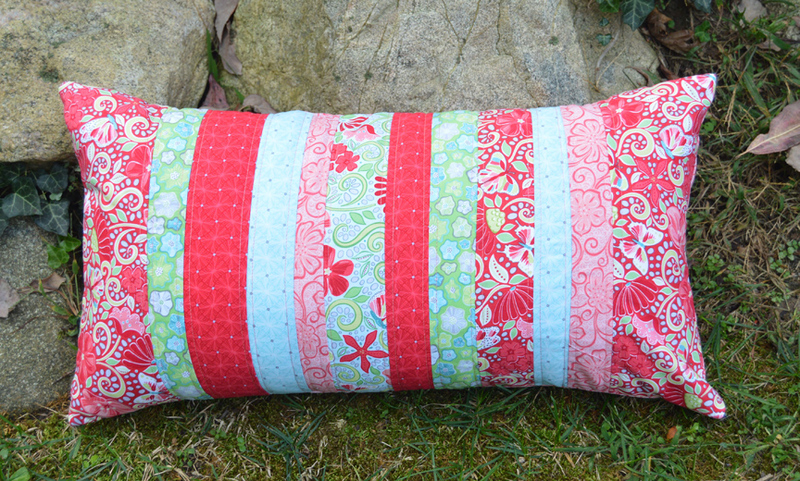 One pillow features wonky angled strips--a bit of improv piecing--and the other features straight strips. Both are fun to make and both are quilt as you go! Step 1: Position 1 strip face up along the edge of the 20" batting square. 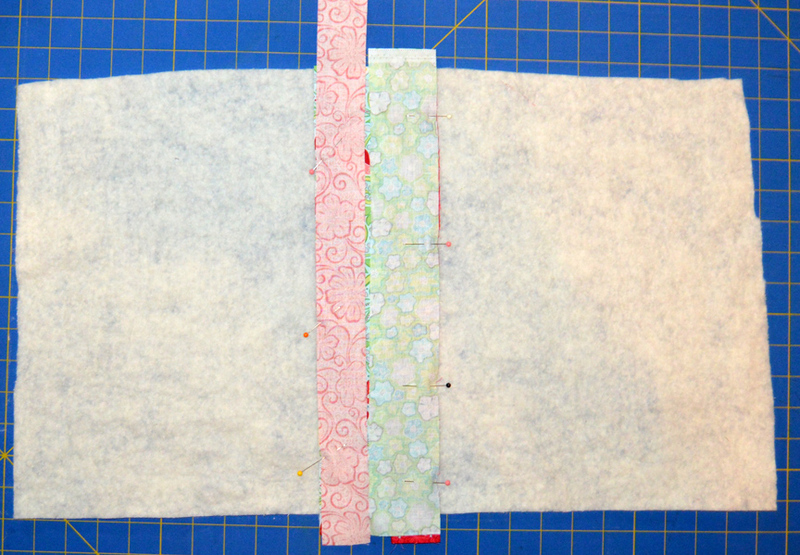 Position a second strip on top, right sides together, angling slightly as shown. 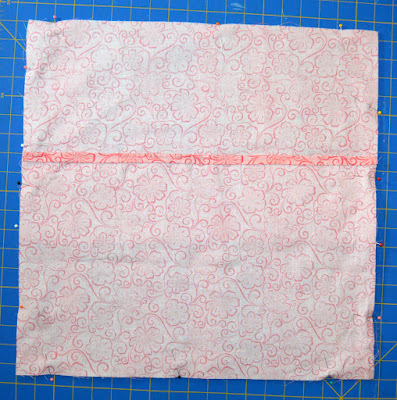 Step 2: Stitch using a 1/4" seam allowance. 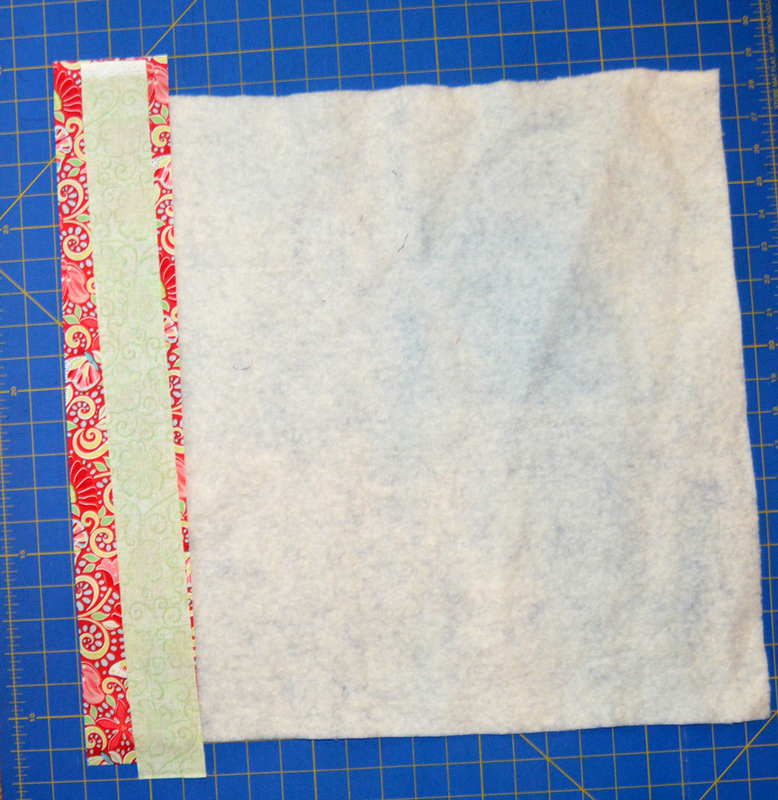 Fold batting out of the way and trim excess red strip 1/4" past the seam allowance. Step 3: Press the second strip open. Step 4: Add another strip in the same manner, angling slight in a different direction. Step 5: Continue adding strips. 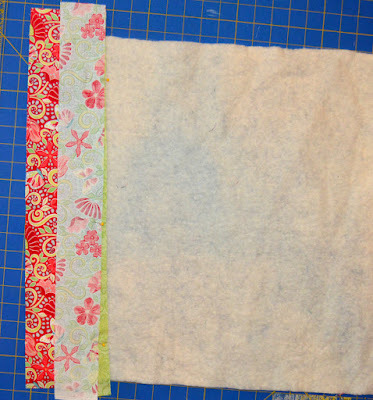 Step 6: Add strips until the entire piece of batting is covered. Step 7: If desired, quilt the pillow front. (You don't have to, because the top was assembled using the quilt as you go method.) 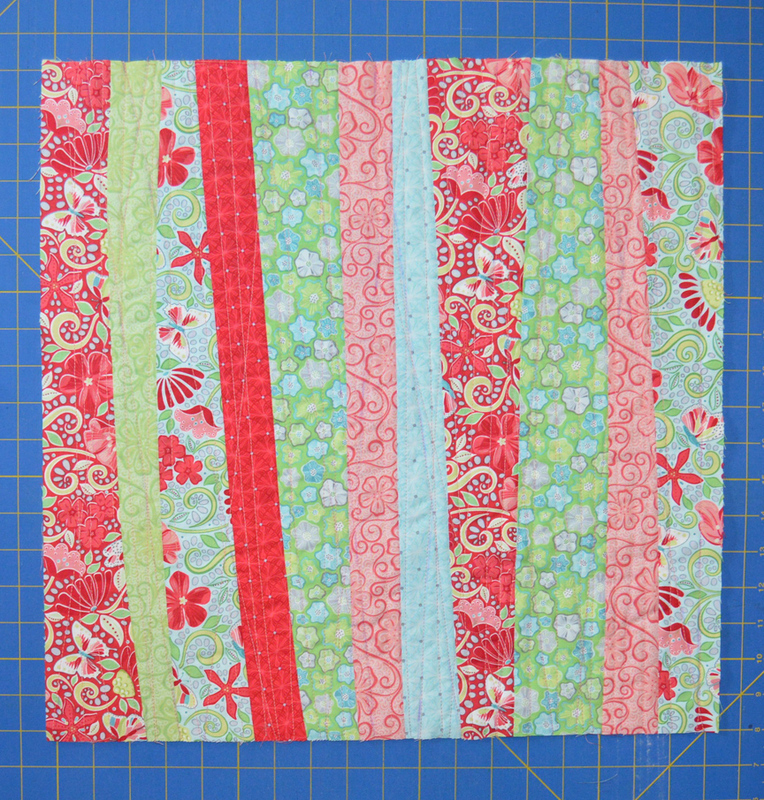 Ours is quilted using straight lines at a variety of angles. 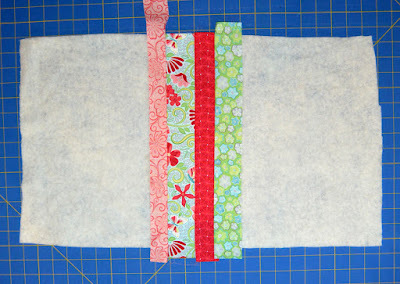 Trim pillow front to measure 18-1/2" square. 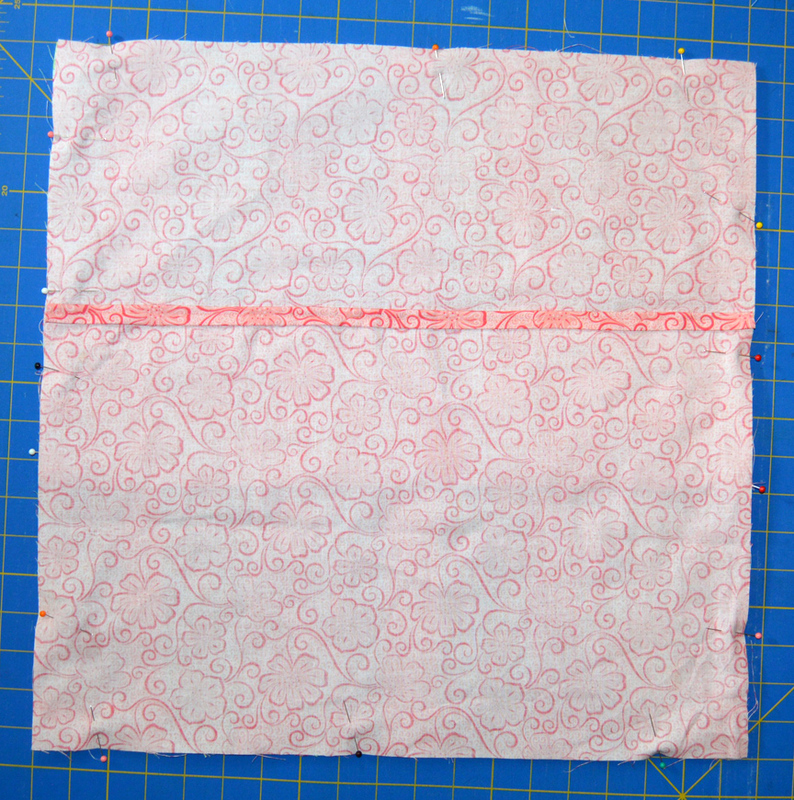 Step 8: Fold a long edge of each 13" x 18-1/2" light red floral strip over 1/4" and then 1/4" again to create a finished edge. Press and then topstitch. Step 9: Layer one backing piece right sides together on the pillow front, aligning raw edges. Pin in place. 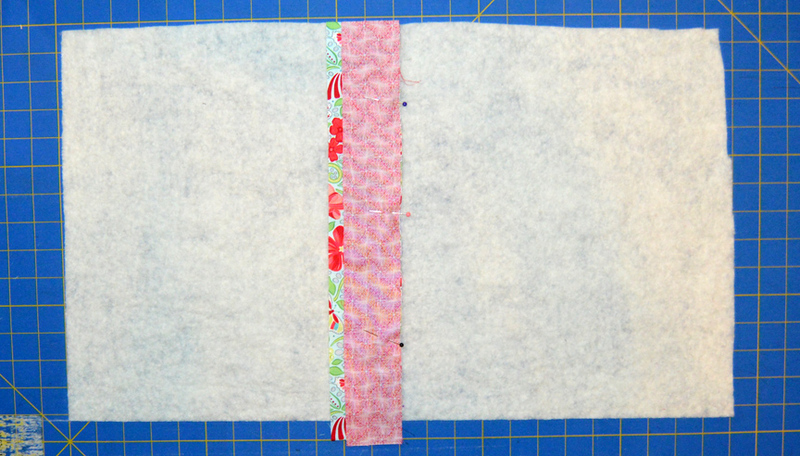 Step 10: Layer the second backing piece on top, overlapping the first backing piece. 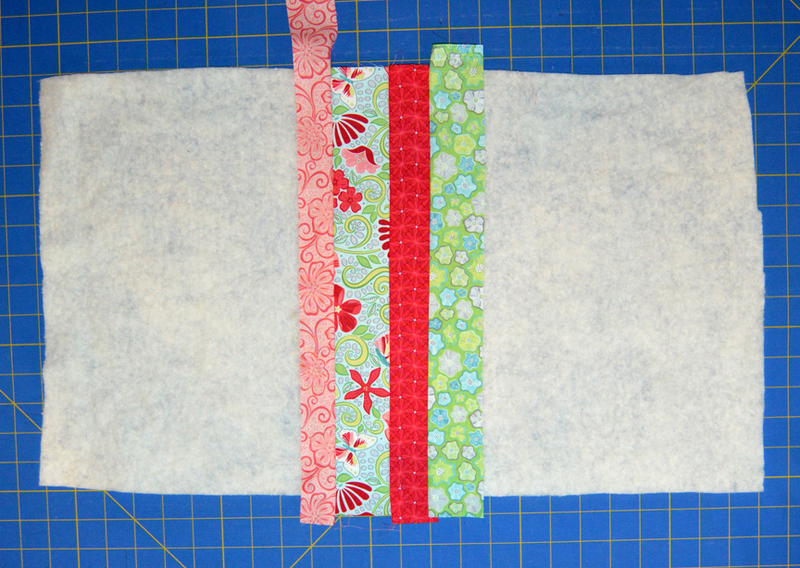 Pin in place and stitch around all sides of the pillow using a 1/4" seam allowance. 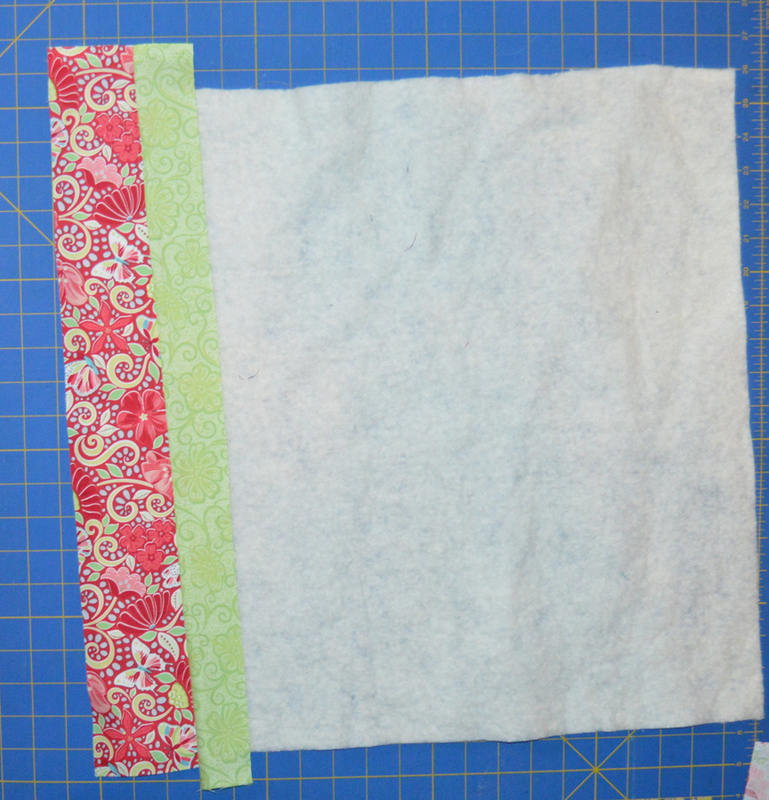 Step 11: Clip corners and turn the pillow right side out. Stuff with the 18" square pillow form. Step 1: Layer two strips right sides together on the 14" x 24" batting piece as shown. Step 2: Press strips open. Step 3: Continue adding strips. Tip: You can pin strips in place on both sides to speed up the efficiency of the project. 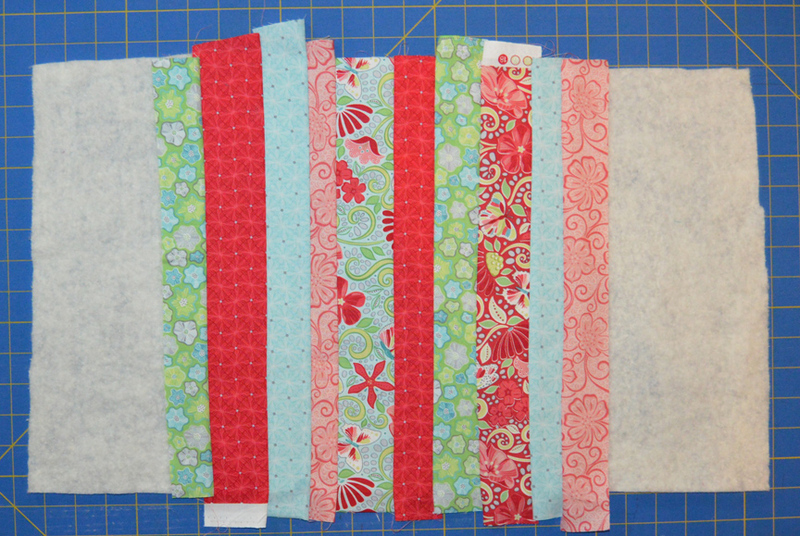 Step 4: Here's what it looks like with four strips added. Measure after adding strips and trim strips (not batting!) as needed to keep everything straight. Step 5: Continue adding strips until section measures 14-1/2" wide. 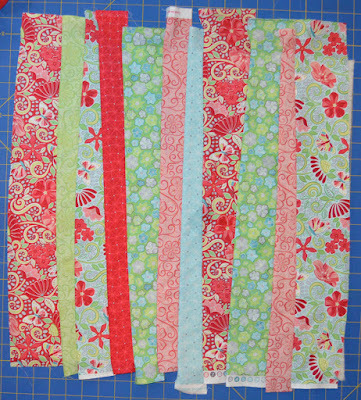 Step 6: Sew 5" x 14" red floral strips both ends. 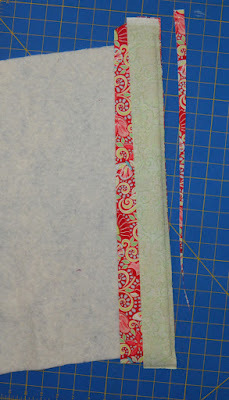 Quilt as desired (we quilted 1/4" from each seam line). Trim to measure 12-1/2" x 22-1/2", making sure the red floral strips at each end are equal width. 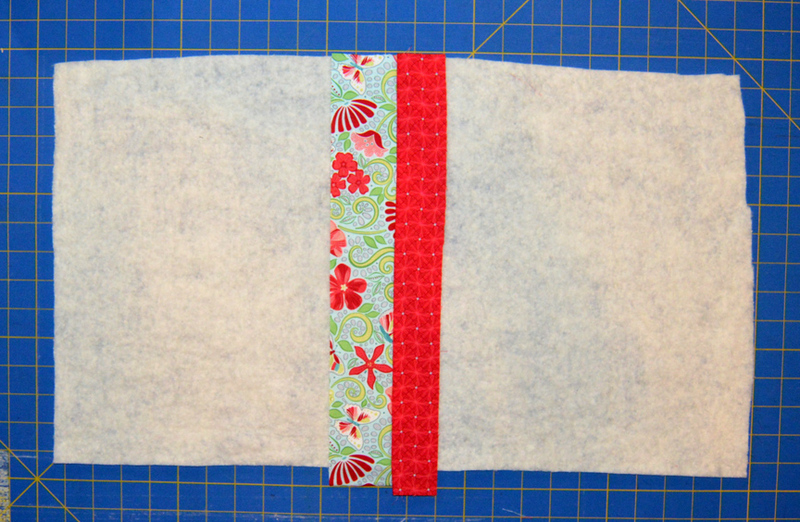 Step 7: Use the (2) 12-1/2" x 14" light red floral pieces to make the backing, creating finished edges along one shorter edge of each piece. 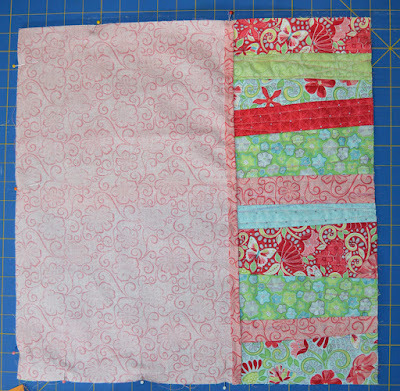 Layer pieces right sides together on the pillow top, matching raw edges, and overlapping in the center. 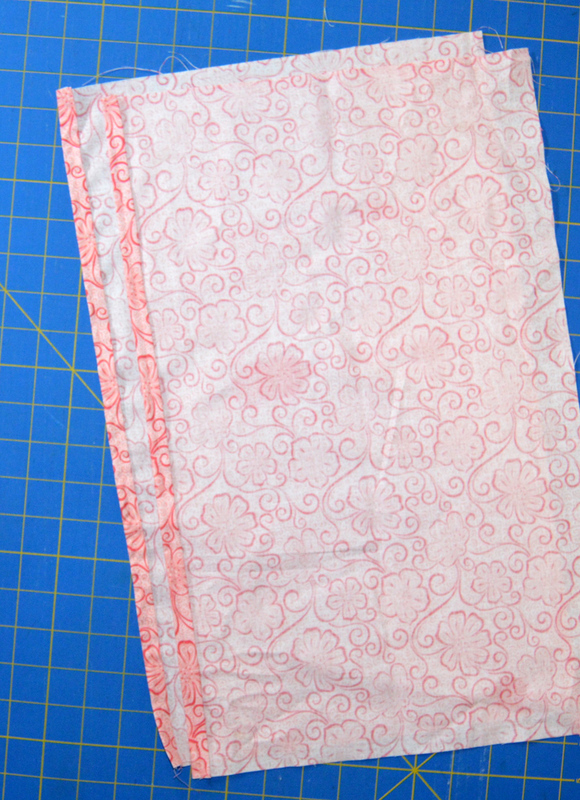 Step 8: Sew around the pillow edge with a 1/4" seam allowance. Clip corners and turn pillow right side. Stuff with the pillow form. Two pillows, ready to enjoy! For a chance to win a fat quarter bundle of Meadow Dance fabrics, leave a comment below letting us know your favorite print in the collection. Giveaway is open through Saturday, September 23rd at 11:59 pm EDT. Follow along on all four days of our Meadow Dance blog hop! 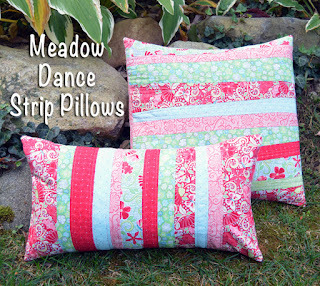 Click here to see our original Meadow Dance post. Click here to see the entire Meadow Dance collection. Click here to visit Amanda's website and find her patterns. I really love the pillows and I especially like that they were made using the quilt-as-you-go method. Thank you for sharing and for the giveaway. My favorite print is Wildflower White (And I love the Garden Path Aqua). Very pretty. I especially like the white background, floral with butterflies. Cute pillows! I love that they are so easy and quick! I love the Garden Path Aqua the best, but they are all gorgeous! My favorite (today) is GARDEN PATH RED. But I really like the whole collection, so I will likely have a different favorite tomorrow! Love the pillows! My favorite print is the Crochet Lace Grey. The Wildflowers Grey/Multi is a close second! What fun happy pillows to brighten up anyone's day!! Absolutely love this collection!! 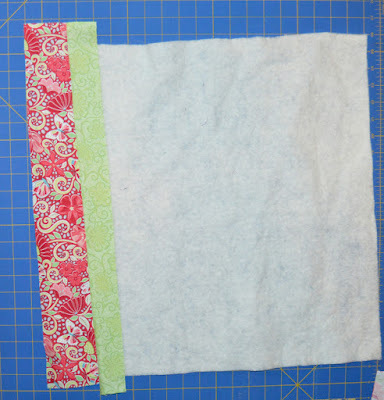 Fun and quick project with beautiful fabrics. Thanks for the wonderful tutorial for a scrappy pillow. My favorite print is Floral Blender Turquoise. Love all of the blenders as add so much texture to a project. Love the pillows. My favorite fabric is the white with the large flowers. The flowers just pop. I love the bugs, all colors, that would make a fun background in a quilt. Thanks for the giveaway! Blue & green little flowers on dark grey. So different to use a dark background! Garden Path Light Plum is my favorite, but I like them all. What a beautiful, joyful collection! I follow via Bloglovin. My favorite print is the Wildflower white...love its fresh spring look! The pillow are fun. I like the free-form piecing too. Thanks for sharing the giveaway! My favorite is Crochet Lace in Aqua, and I know I am going to be using a lot of the Diamonds in all of the colors--such great blenders! Sweet pillow. I think I will make some, thank you for the tutorial it looks easy peasy! I like the Garden Path in Aqua. I love the Garden Path Aqua! Loved the Wildflowers Gray Multi the first time I saw it! Reminds me of the 70's, also. 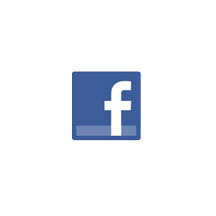 I follow on facebook, bloglovin, email. I would love my favorite Crochet Lace in grey for an applique background. I really like that pillow! Wildflowers white multi is my favorite in the line. Fun pillows!!! Garden path in Aqua! Floral fabrics are always my favorites! In this spectacular collection it was really difficult to choose just one; but I finally chose Floral Blender Dark Grey. 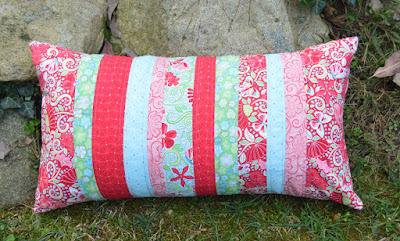 This Quilt As You Go Pillow Tutorial was a great tutorial and one I will be using for Christmas Gifts this year! Thank you for sharing this great tutorial and the wonderful give away! Wildflowers gray-multi is my favorite! Garden Path gray is one of my favorites from this collection. I like the garden path print in plum. Although the decision was difficult! Crochet Lace -particularly in aqua. Love the strip piecing to make the pillows. Quick and easy! I love the Wildflowers in white. It's so bright and cheerful. I really like the Flora Blenders - especially the Light Green. My favorite is the Wildflowers white/multi. I know gray is very popular right now, but it just doesn't do anything for me. Great line of fabrics. Bugs Aqua is my favorite. All are pretty. I love the pillows! My favorite print is Wildflowers Grey/Multi. Just beautiful! Love the wild flowers grey/multi. The flowers are vibrant and the black background makes everything stand out. Love the pillows. Love the Wildflowers with the white background. Very versatile. And fun and easy pillows! thanks! Pillows are so bright and colorful, reminding me of spring and summer. My favorite print is the Wildflowers. Garden Path in red is my favorite. Thanks for the pillow how-to. Really like the Garden Path Aqua. Thank you for quick pattern. I really love the Garden Path Light Plum. I love the bugs White. I love ladybugs and these are so cute! Love the others designs in the print, too. It would be fun to use in a quilt! The light green floral blender is my favorite. Those are great pillows. I like seeing someone else who makes pillow backs like I do. =) There's nothing like a good affirmation. Thank you for the tutorial and the giveaway. Wildflowers gray multi is great--also like the different lace prints. Garden Path is my favorite, especially in the reds. I like the Crochet Lace in aqua but they are all very nice. I like Wildflowers Grey/Multi. The bugs are really cute, also. 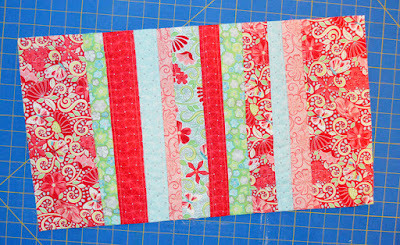 Garden Path Red is my favorite, but this whole collection has fabulous colors and prints. Both of your pillows are beautiful with all of the bright, happy colors. 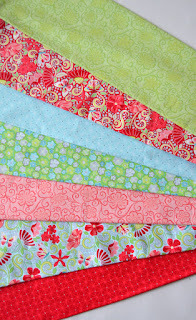 I love the Garden Path in Aqua - hard to choose as the entire line is lovely! I like the Wildflowers in grey. O I Love the swirlies with the little butterflies! Gorgeous Colors! I really like the bugs in all three color ways. Garden Path, Aqua. Who can resist those cute bug prints too! Thank you Allsion for sharing the QAYG pillow . Love it. Beautiful fabrics. I love all of them. I love be the Wildflowers in Grey! I love the Bugs in White. Thanks! I love them all! But I will choose out WILDFLOWERS WHITE/MULTI to share here. My favourite print is Garden Path Red. My favorite is the bright large flowers on the dark gray background! The lace flower fabric is so cute. And the pillows are adorable! I love garden path aqua. Thanks for the chance to win this great giveaway. I like all the floral blenders. Quilt as you go is great. Gardenpath aqua...very pretty line. I'll be back to look again for other project. I liked the Garden Path in gray, but they are all very pretty! The projects you are showing are great! I love the red print with the butterflies. I love the meadow blooms pattern. they are all beautiful and the fabrics are great. I love it all. Wildflowers in White and then the Blenders are my favorites. I also adore the bugs too! Really cute pillows! I love the Wildflowers on grey/multi. I love really bright colors against dark backgrounds-makes them POP! I like the pink/red butterflies as well as the blue with the red/pink flowers. What a delightful design.